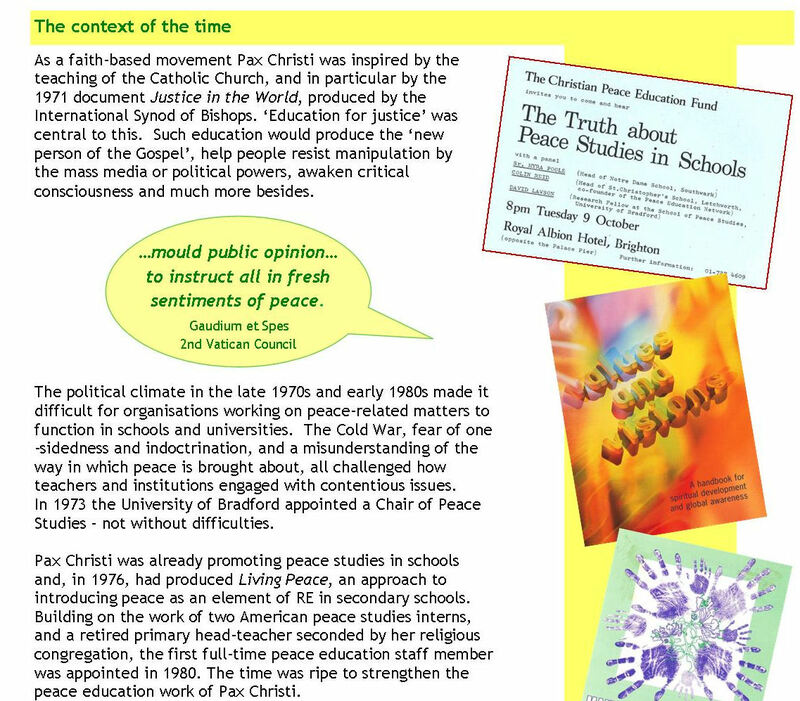 Peace Trails, school exchanges, peace history conferences, dvds and study guides are just some of the many project that have been funded by the Christian Peace Education Fund since it was established in 1982. Set up by Pax Christi to support its own peace education work the Fund also wanted to ‘promote peace by means of meetings, lectures, seminars, the production of books and publications and lots more besides.’ All of this work will be celebrated at a gathering to be held in London on 2 November and hosted by Archbishop Malcolm McMahon, National President of Pax Christi. The Fund has also supported four Pax Christi peace education workers, the first was actually appointed in 1980. This work has flourished over the years and today Pax Christi produces high quality on-line educational resources on themes ranging from the vocation to peacemaking, the lives of contemporary peacemakers to peacemaking and conscience in times of war. With others Pax Christi facilitates INSET training days for teachers. Direct contact with students and teachers is an important part of this work and Pax Christi’s education worker spends an average of 40 days a year in schools, offering workshops, seminars and talks on peacemaking. At the launch on 2 November, guests will hear Pax Christi Vice President Valerie Flessati speak of the origins and aspirations of those who established the fund and from those who have benefited from the Fund. Most recent is the Faith in Action Day held in July at St Paul’s School in Milton Keynes. As well as offering financial support for this day, Pax Christi contributed with resources and workshops. Our grants provide support for UK-based peace education projects.